Die Klimazwiebel: Leaving carbon underground and paying for it: the way forward? Leaving carbon underground and paying for it: the way forward? 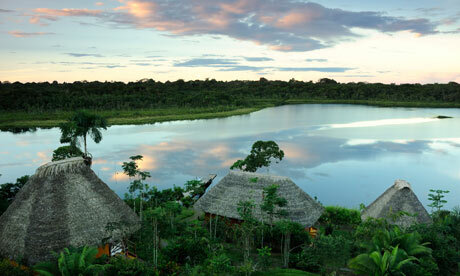 Yasuni National Park in Ecuador is one of the most biologically diverse places on Earth. On 600 ha. there live more species of amphibians, reptiles, birds, and mammals than anywhere in the western hemisphere. See here for a short overview. However, huge oil reserves are known to lie underneath the park which would inevitably lead to oil extraction with many undesirable side effects. The government of Ecuador came up with a proposal that would leave the oil buried underground - in exchange for cash. The government requests compensation from the international community for lost revenue, at least of 50% of the profits that it would receive were it to exploit the reserves. The Guardian reports about early results of this effort which has been carried out via "crowd funding". This is a very interesting initiative which merits wide attention. There a many benefits to the region (and beyond) by keeping the land intact. The benefits are not only, and not primarily related to climate change (allegedly 'only' 400m tons of CO2 would be avoided which amounts to 1.3% of global annual CO2 emissions). Furthermore, local people seem to be in support. As the Guardian reports, 63% of Ecuadoreans are aware of the initiative and 86% of those support it. However, various interesting questions arise. For example, what level of biodiversity is required to make such efforts worthwhile? Would it make sense to pay Saudi Arabia, Russia or Venezuela (or any other exporter of fossil fuels) to leave the carbon where it currently is? How much compensation should be paid? Does this not open the doors to holding the world to ransom, using biodiversity as a weapon? And how can one make sure that a nation who received such compensation does not extract the fuels at a later date? And how can one make sure that a nation who received such compensation does not extract the fuels at a later date? You can't. And that's the least of the problems with the Yasuni-ITT scheme.